Activity based on https://publiclab.org/wiki/balloon-mapping-guide, and it covers the entire balloon kit except for the camera. Do you want to make maps? Do you need satellite images but can't afford them? Do you want to see your home from above? Follow these instructions and you can, for as little as $100! Purchasing The Balloon Mapping Kit assembled by Public Lab is one quick way for you to take aerial photographs. --protective canvas gloves for handling the line. Thin line can cause burns to unprotected hands. To save even more money, two or three $1.50 mylar emergency sleeping bags cut costs, and retain helium better if inflated for more than a few hours. See discussion, but they must be carefully taped shut and sealed very well to work, which takes some practice. at least 1000 feet braided nylon string, like kite string (which you can buy a la cart from the Public Lab Store), mason line, anything strong and very light. You can tie two 500' spools together into a 1000' line. 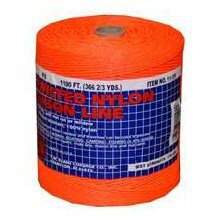 The mason line, a medium weight nylon #18, rated to ~150 lbs, is your simplest choice, easy to get at a hardware store. It's often sold in 500 foot rolls for a few dollars. Buy 2 or 3, wind them onto a reel one at a time tying them end-to-end, to get to at least 1000-1500 feet minimum. Use leather gloves to protect your hands. $13.95 10" Yo-Yo style reel, which is less likely to damage your line, but takes longer to reel in. ~$3 metallized mylar sleeping bags -- you'll need 2 or 3 per flight; get the ones that already have yellow taped seams, and you just have to tape up the opening. If you properly fold over and tape this last seam, and check the other corners for leaks, it should stay inflated for several days. 1" wide Gaffer tape is lovely -- it sticks and resticks many times, and is very strong. If you're going to be doing a lot of this, consider buying an aluminum helium tank, which you can keep as long as you like, and which is much easier to carry: 280 dollars for 125 cu feet (~2 flights) or 180 dollars for 55 cu feet (~1 flight). $20 3000 foot 50 pound Dacron kite line (update: site down). there's sometimes a deal for $10 pink reels, but dark colors probably show up less in photos. For much higher flights, ~4000+ feet, you want lighter and stronger string. Monofilament fishing line (the clear kind) is risky because it can suddenly snap. Braided spectra gets worn and will also snap unexpectedly. This may be because fishing line (esp. high strength) is designed to be used in the open ocean without obstacles to get caught on or tangled in. But if you're careful it has very low drag and we've used it for some great flights on days with almost no wind.